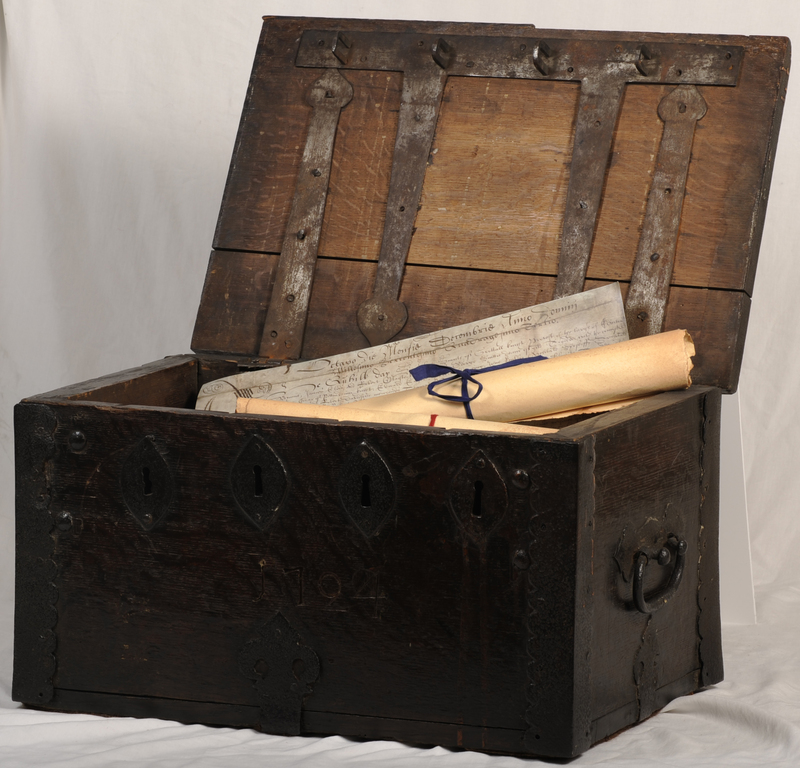 The Society of Barbers archive (1722-1922) has now been catalogued and is available on the Archives Hub here. (The catalogue will also soon be available through our online catalogue on the Library website, which is currently being upgraded). The preservation and cataloguing of the archive was made possible through generous funding from the Wellcome Trust. In 1505 the surgeons and barbers of Edinburgh jointly appealed to the Edinburgh Town Council for incorporation. This was granted on July 1st 1505 and the Seal of Cause subsequently ratified by King James IV in October 1506. Despite having practised the craft of surgery for centuries, from this date barbers were expected to pass examinations in anatomy and surgery if they were to continue undertaking their trade in Edinburgh and its suburbs of Canongate, Leith and Portsburgh. With the dual examination, barbers could become dually-qualified practitioners in the trades of surgery and barbery, and also members of the Incorporation of Surgeons and Barbers of Edinburgh. Over the course of the seventeenth century splits formed between the ‘simple barbers’, ‘barber-chirurgians’ and ‘chirurgians’. Despite a long association, the barbers would feel increasingly marginalised, with their privileges and scope of work curtailed by the surgeons, including office-bearing in the Incorporation and their barbering restricted to the suburbs. The surgeons would formally strengthen their position in 1694 when the terms of the Seal of Cause were redefined. This new ratification, being confirmed in Parliament in 1695, gave the surgeons “full power over all persons exercising surgery, pharmacy or barbery within the bounds of the city of Edinburgh”. Moreover, whereas the barbers had previously held the same rights of surgeons, they were now ignored completely in favour of the apothecaries, thereby creating the ‘surgeon-apothecary’. As such, the barbers had no say in the administration of the Incorporation, nor were they entitled to benefit from fees they contributed as members. Further, in order to enable entrepreneurial surgeons to have the monopoly of offering barbering services as well as surgical treatments in the city centre, the 'simple barbers' were frequently brought before the courts for practising outwith their jurisdictions in the suburbs, with some even finding themselves in Edinburgh's Tollbooth Jail. Resentments caused by loss of control through unequal division of governing power climaxed in 1722; the Barbers formally separated from the Incorporation by decreet of the Court of Session. That same year the Society of Barbers of Edinburgh was formed (sometimes known as the Corporation of Barbers). 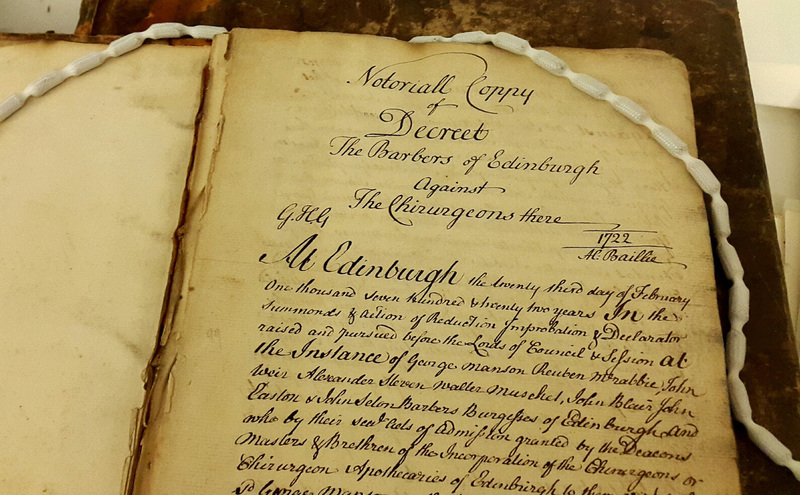 The Society of Barbers was wound up in 1922 when the Archive came to the Royal College of Surgeons of Edinburgh. The collection provides good coverage of the activities of the Society and the work of barbers operating in Edinburgh. Of particular interest are records relating not only to the role the Society played as charity givers, through the Trades Maiden Hospital for instance, but also those that illuminate the precarious lives led by some barbers and their families, particularly the widows of former barbers. A further highlight are the papers revealing the continuing tensions between barbers, hairdressers and wigmakers, particularly those who established barber shops without formal training. 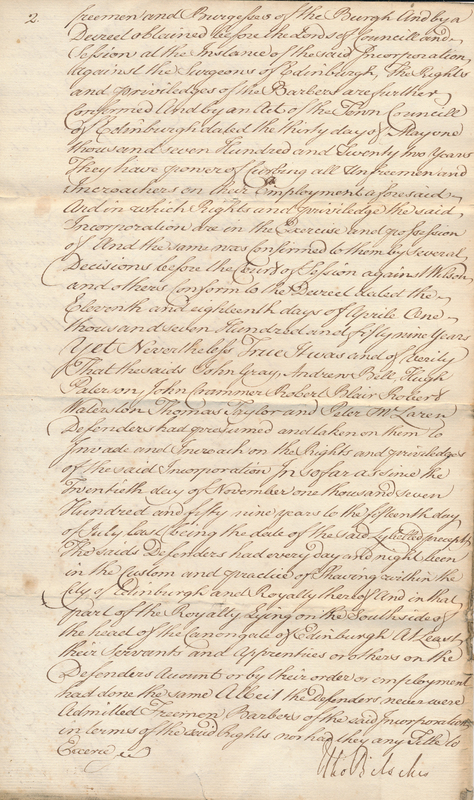 The archive comprises: SB 1: Laws and Acts of Dean of Guilds and Town Council of Edinburgh (1722-1846); SB 2: Minutes (1722-1922); SB 3: Accounts and financial papers (1727-1922); SB 4: Indentures (1805-33); SB 5: Admissions (1735-84); SB 6: Correspondence (1758-1859); SB 7: Litigation (1722-1829); SB 8: Petitions to the Society (1827-28); Petitions for charity to the Society and Trades Maiden Hospital (1763-1922); SB 9: Searches for incumbrances (1780-1859); SB 10: Inventories of Writs (1728-1851); SB 11: Title deeds (1721-1853); SB 12: Business papers (1730-c.1922); SB 13: Miscellaneous (c.1722, 1830). 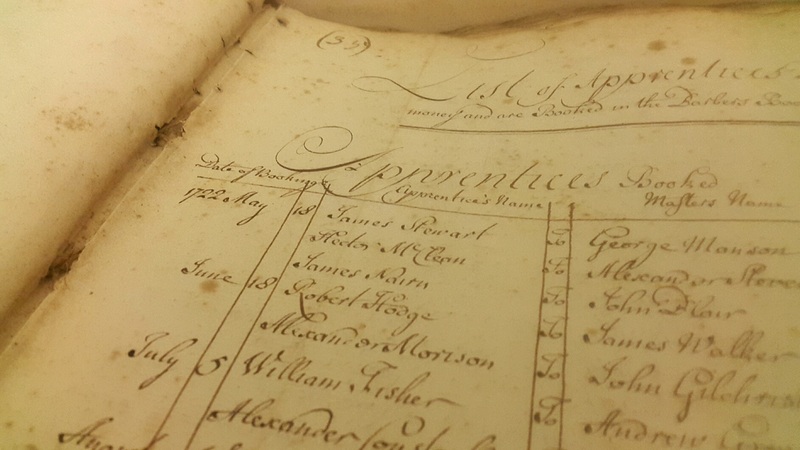 Please note, for extensive archive material relating to the pre 1722 activities and relationships between the surgeons, barbers, barber-surgeons, apothecaries and surgeon-apothecaries, please see the main Royal College of Surgeons of Edinburgh institutional archive (catalogue ref: RCSEd). which will soon be available.